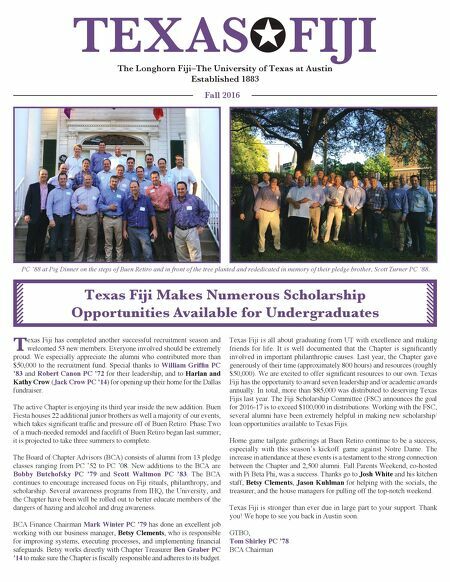 The Longhorn Fiji–The University of Texas at Austin Established 1883 TEXAS FIJI H Fall 2016 Texas Fiji Makes Numerous Scholarship Opportunities Available for Undergraduates T exas Fiji has completed another successful recruitment season and welcomed 53 new members. Everyone involved should be extremely proud. We especially appreciate the alumni who contributed more than $50,000 to the recruitment fund. Special thanks to William Griffin PC '83 and Robert Canon PC '72 for their leadership, and to Harlan and Kathy Crow (Jack Crow PC '14) for opening up their home for the Dallas fundraiser. The active Chapter is enjoying its third year inside the new addition. Buen Fiesta houses 22 additional junior brothers as well a majority of our events, which takes significant traffic and pressure off of Buen Retiro. Phase Two of a much-needed remodel and facelift of Buen Retiro began last summer; it is projected to take three summers to complete. The Board of Chapter Advisors (BCA) consists of alumni from 13 pledge classes ranging from PC '52 to PC '08. New additions to the BCA are Bobby Butchofsky PC '79 and Scott Waltmon PC '83. The BCA continues to encourage increased focus on Fiji rituals, philanthropy, and scholarship. Several awareness programs from IHQ, the University, and the Chapter have been/will be rolled out to better educate members of the dangers of hazing and alcohol and drug awareness. BCA Finance Chairman Mark Winter PC '79 has done an excellent job working with our business manager, Betsy Clements, who is responsible for improving systems, executing processes, and implementing financial safeguards. Betsy works directly with Chapter Treasurer Ben Graber PC '14 to make sure the Chapter is fiscally responsible and adheres to its budget. Texas Fiji is all about graduating from UT with excellence and making friends for life. It is well documented that the Chapter is significantly involved in important philanthropic causes. Last year, the Chapter gave generously of their time (approximately 800 hours) and resources (roughly $50,000). We are excited to offer significant resources to our own. Texas Fiji has the opportunity to award seven leadership and/or academic awards annually. In total, more than $85,000 was distributed to deserving Texas Fijis last year. The Fiji Scholarship Committee (FSC) announces the goal for 2016-17 is to exceed $100,000 in distributions. Working with the FSC, several alumni have been extremely helpful in making new scholarship/ loan opportunities available to Texas Fijis. Home game tailgate gatherings at Buen Retiro continue to be a success, especially with this season's kickoff game against Notre Dame. The increase in attendance at these events is a testament to the strong connection between the Chapter and 2,500 alumni. Fall Parents Weekend, co-hosted with Pi Beta Phi, was a success. Thanks go to Josh White and his kitchen staff, Betsy Clements, Jason Kuhlman for helping with the socials, the treasurer, and the house managers for pulling off the top-notch weekend. Texas Fiji is stronger than ever due in large part to your support. Thank you! We hope to see you back in Austin soon. GTBO, Tom Shirley PC '78 BCA Chairman PC '88 at Pig Dinner on the steps of Buen Retiro and in front of the tree planted and rededicated in memory of their pledge brother, Scott Turner PC '88.